Contact Tanya Thibodeaux at 903-780-9264. River otter pups are very susceptible to pneumonia / upper respiratory infections, and can succumb to these infections within 12 hours. It is imperative to save the life of otter cubs, that they be placed in the hands of a trained professional just as soon as possible. 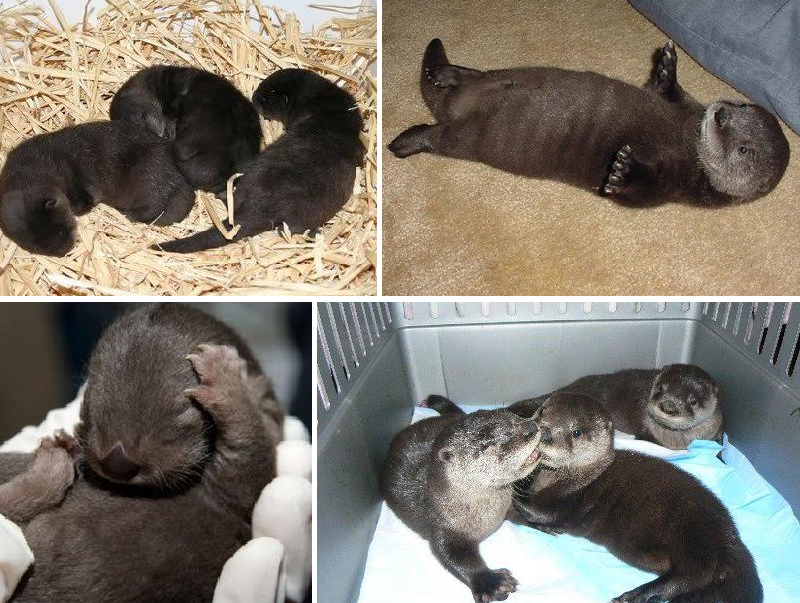 Try to handle the otter cub as little as possible. Be mindful of being bitten. A frightened baby can exact quite a bite once it’s eyes have opened and teeth have erupted (5-6 weeks old). This is a WILD animal. No matter how tempting, DO NOT ALLOW SMALL CHILDREN TO HOLD THE BABY. Place the baby on a heating pad, set on LOW setting. Place a bath towel, folded to make about a 1 to 1 1/2 inch thickness and put it on the heating pad. Now, place a box on top of the towel. Place the pup into a soft cloth such as an old flannel shirt, or old sweatshirt or sweatpants. Place the infant, nestled in the cloth, down into the box. That way, a gradual heat will come up through the layers and warm the infant, but not make him too hot. PLACE THE BOX IN A WARM QUIET PLACE. DO NOT ATTEMPT TO FEED THE OTTER PUP. The digestive system of each of the species of wildlife babies is complex and individualized. COW’S MILK, WHIPPING CREAM, EVAPORATED MILK, MOST STOREBOUGHT FORMULAS, AND HUMAN INFANT FORMULA, to list just a few, can be DEADLY TO river otters. If it has been over 12 hours and you are still unable to contact a Wildlife Rehabilitator for advice and placement of the baby, you can follow these instructions to prevent severe dehydration. REHYDRATION: If the baby has not had any fluids in more than 12 hours, you can rehydrate with fluids AFTER the infant's body temperature is back up to normal. NEVER give anything by mouth to a COLD animal whose body temperature has dropped below normal. A good re-hydrating solution can be made by mixing the following: 1 pint of boiled (or distilled) water - 1 teaspoon of sugar - 1/3 teaspoon of salt. ESBILAC puppy’s milk replacement formula (PetAg) is the formula of choice for North American River Otter pups. This can be purchased at Tractor Supply, Atwoods, or most local veterinary offices. HOW TO FEED: The best way to feed infant mammals is with a 1cc or a 3cc oral meds syringe. You can control the flow, and the baby doesn't have a tendency to aspirate the formula by sucking in too much at a time. If the infant should aspirate, stop the feeding, hold the baby upside down for a moment, and wipe the fluid from it’s nostrils as it sneezes. Continue the feeding once the nose is clear. If you're not familiar with syringes and cc's and ml's, most pharmacy’s will give you one or sell it to you for a few cents. SYRINGE FEEDING IS EASIER TO CONTROL THAN BOTTLES OR EYEDROPPERS AND DECREASES THE RISK OF ASPIRATION PNEUMONIA, WHICH IS USUALLY FATAL. It is illegal for a person to possess any protected, wild, furbearing mammal that is protected under Texas State law. Until you are able to contact and place the orphan with a permitted Wildlife Rehabilitator, you can follow these GENERAL CARE INSTRUCTIONS to give the wild infant mammal the best chance for survival. LEGAL CONCERNS: Anything on the States list of protected species requires a special permit for a person to have them in their possession. You can view a list of the protected wildlife species at http://www.tpwd.state.tx.us/huntwild/wild/rehab/protected.